Recently I was surprised at the grocery store, at the lack of organic juice choices. There were maybe 2 or 3 brands to choose from. The one that stood out the most, based on appeal and variety was Uncle Matt's. Uncle Matt's is grown and bottled right here in Florida. It's always organic and pesticide free, and has been since 1999! 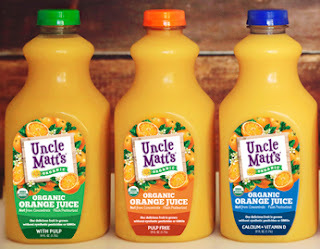 Uncle Matt's juice is a delicious blend of USA grown organic Hamlin and Valencia oranges developed over four generations. The Hamlin orange was Uncle Matt’s grandfather’s favorite orange because of its high vitamin C content and dynamic, robust flavor. He would squeeze a glass every morning before he rode the groves. The Valencia orange is Florida’s most famous variety, known for its deep orange color and sweet juice. When you blend these two together you get a dynamite fresh squeezed taste reminiscent of a roadside stand. I love all the different varieties available! Uncle Matt's products are also available in single serve bottles, as well as the family size. You can find a store that sells it here, but I find it locally at Publix and Whole Foods.